At last! I have finished piecing the four sections. I LOVE the way the color moves across the piece. The redder section becomes the light sourcepoint and all the "imagery" will radiate out from there. This is the back of the reddish section (section A). 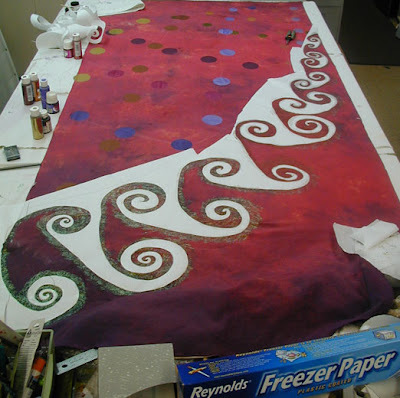 I am using freezer paper to act as a stencil for painting on the swirling vortex that surrounds the slip stream. The circles vary in size and are created using several silkscreens and are applied using acrylic paints. Here are the a & b sections. They are reversed so they correspond to the fronts of similar color. That means the reddish one is on the right. These are the c & d sections. The freezer paper is still adhered. I figured I'd surprise you with the full effect after I get them quilted. 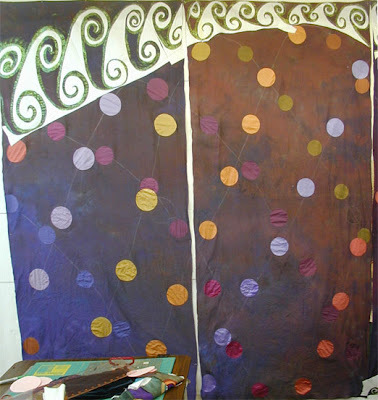 I am currently awaiting paint drying on section A back before I layer and baste before quilting. 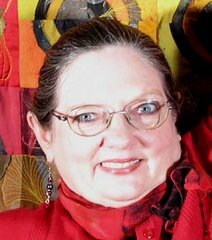 I'll be initially quilitng from the backside- so have to pin with the back up. 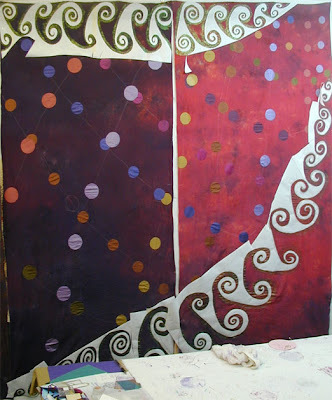 First I'll be outlining all those circles in invisible thread and then the swirling vortexes. After that is done I'll flip it over and re-pin and quilt from the front. 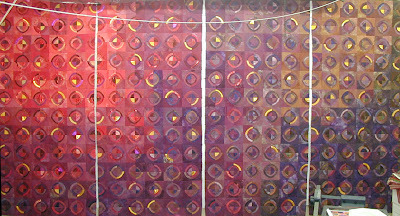 That way the circles will act as landmarks and I can quilt the design that is on the back from the front. Clear as mud? Feel free to ask questions.